An image of the sculpture Nature's Legacy on the campus of the University of Northern Iowa in Cedar Falls, Iowa. 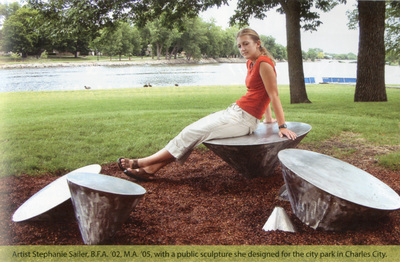 The sculpture by UNI alumna Stephanie Sailer was created while she was a student. It is an Iowa Art in State Buildings Project commission. The medium is stainless steel. "Artist Stephanie Sailer" (2019). Art on Campus Photographs. 35.